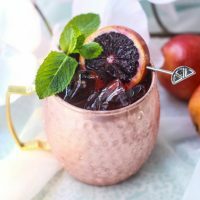 The Moscow Mule cocktail has been majorly popular for some time, but it's time to spruce it up making it a blood orange Moscow Mule. In a cocktail shaker add vodka, Henry’s Hard Orange Soda, Domaine de Canton Ginger Liqueur, the juice of a blood orange (or two blood oranges if they are small), and top with ice. Secure the lid on the cocktail shaker tightly and shake vigorously for 30 seconds. Strain into a standard whiskey glass filled with crushed ice. Garnish with a sprig of fresh mint and a slice of blood orange. Always, drink responsibly and don't drink and drive.